It’s only been two weeks into our school year and I am already finding myself in a lunchbox rut. Freezer cooking to the rescue! Every month, I plan to try a lunch box friendly recipe and share my results. This month I choose Frozen Fruit Cups to try. These healthy cups are full of fresh fruit with a little orange juice. Verdict: They are delicious! However, they melted too much before my daughter’s lunch time. So, instead of packing these in her lunchbox, we are using these as a healthy after school snack. Other fruit as desired. Ideas: pineapple, kiwi, etc. 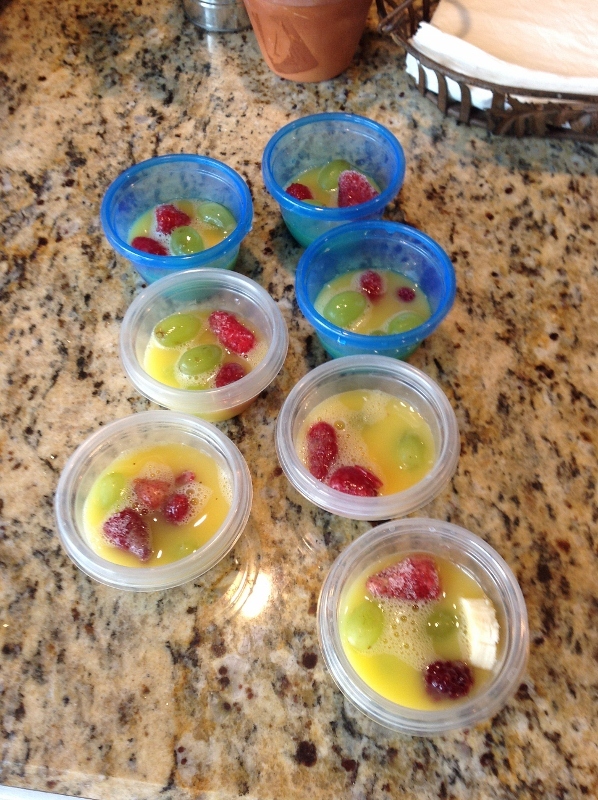 Add about 1/4 cup of mixed fruit into each 1/2 cup Tupperware container. Pour about 1/4 cup of orange juice over each fruit cup. Before serving, let thaw for 5-10 minutes. Enjoy this cool, healthy treat! For more ideas for freezable lunch items, check out our Freezer Meals for Back to School Lunches post! I usually read a daily email, but today I clicked through because as I’m reading I’m thinking “huh! Erin doesn’t have any daughters…” Too bad the newsletter doesn’t include your name! I had no idea that there were writers other than Erin, and that you’ve written 40+ posts to boot! Maybe you could include your name in posts going forward? I would truly love to save this recipe to Ziplist, but it isn’t linked up. Is there other way to add this recipe? The recipe contains a link titled “Save Recipe” which is how you can link to Ziplist. Hope that helps! This is such a great idea! I love the fact that you use orange juice instead of the syrup so many juice cups have. We homeschool so I don’t pack lunches very often but I’m always on the look out for easy, healthy snack ideas to have ready. Thanks for sharing. what containers do you freeze them in? I would love some great ideas on freezable ones that don’t leak that are small like the picture! 🙂 My kids love fruit cups but they are so expensive I am excited to try this!